Place washed blueberries in a medium saucepan along the the water and syrup and bring to a boil and reduce to medium low. Simmer, stirring occasionally to prevent sticking. When blueberries burst and sauce has reduced by half, it should coat the back of a spoon. Remove from heat and allow to cool slightly. To separate the fruit from the sauce pour over a fine mesh strainer. For a thicker sauce place in a blender and blend until smooth. 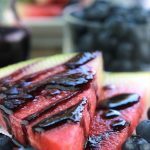 Serve sauce over the sliced watermelon with fresh blueberries.